A rocking way might seem like a pointless purchase when you already have a sofa, armchair and other types of seating in your house, but when it comes to crying babies and 3am feeds, you’ll regret it if you don’t have one. A rocking chair is next to the crib, so you don’t have to move far, and the rocking motion will soothe baby to sleep, and back to sleep in the middle of the night without the time for a major crying session. A traditional rocking chair rocks back and forth over an arc, whereas the newer gliders smoothly slide back and forth. For me, it doesn’t matter which one you choose. 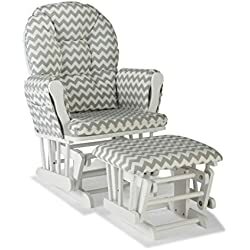 A glider is safer if you have other young children as rocking chairs can crush little fingers if they’re left crawling around while you feed another child, but they are also more expensive than a simple rocking chair. Both often come with a matching footrest or ottoman, and some have pockets on the side for storage. What to consider when choosing a rocking chair or glider? A good rocking chair will have thick, durable fabric. This is to cope with wear and tear of muliplte uses per day, and well as its fair share of spit up and spillages. Ideally, a busy parent wants machine washable fabric, and good enough quality that it won’t wear thin. Woven fabrics don’t fray as easily which means that usually they last a little bit longer than others. A rocking chair should, hopefully, massively reduce the time it takes to get your baby to sleep, but there will be times where he or she just isn’t having it. That means you could end up sat in the chair for long periods of time, and might even have a nap in the process. So something to look for is a good, cushioned seat. It should support your back and arms and be thickly padded under your derriere. As well as the seat being soft and comfortable, it should be wide enough for you and your baby, and not feel at all cramped, because you want like it and your baby won’t feel relaxed nursing there. You might take a while to find a comfortable nursing position and might try out different kinds of cushions and supports, so it really is important to have the space around you while you find the position that works best for you and your bambino. If you’ve spent a long time planning and decorating a lovely nursery for your newborn, you don’t want to then put in a big ugly chair. If you’re strapped for cash you might have to settle for anything, but it wold be a shame to get something that looks completely out of place. Lots of rocking chairs and gliders are available in different colours so you should quite easily find something hat suits you and your home. Whether or not you want an ottoman is an entirely personal decision. They can be practical and comfortable for some, but others prefer the stability of their feet firmly on the ground, especially on a moving chair. 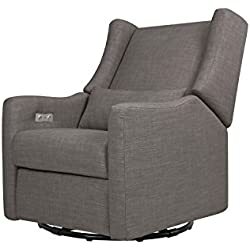 You can find ottoman and rocking chair/glider sets, and you can also buy them separately, so you could try out the chair on its own and buy an ottoman later, or buy a cheaper ottoman separately if price is an issue. As a breastfeeding mother, you might find that gliders are more comfortable as nursing chairs as they often provide extra cushions or removable cushions and padding, that you can adjust or move to find a more comfortable position for you and your baby. There are some rocking chairs for nursing mothers but I find that the differences between nursing and standard rocking chairs is minimal. That said, mothers have been known to feed in all sorts of places, so any comfortable chair will allow you to rest while you nurse. Away with the stiff wooden frames and in with the comfy armchair-style rocking chairs! The Hadley double rocker by Baby Relax is a nursery armchair which is one and a half the size of a standard rocking chair, it’s spacious enough for you, your baby and maybe even your partner, to really savour those family moments. 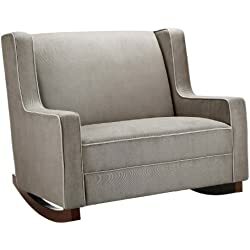 The feet are in solid wood, and the chair is upholstered in linen-look polyester fabric in either taupe or beige, and has thickly padded cushioning on the back and seat. Parents say they have surpasses the weight limit of 225lbs in the chair and it holds up well, but the assembly is tricky. If you want a comfortable rocking chair for mum and baby or dad ad baby, this won’t let you down. This hoop glider and ottoman set by Storkcraft glides smoothly using enclosed metal ball bearings, allowing you to put your feet up as it glides in tandem with the ottoman. This glider is extremely practical as there are 2 side storage pockets to keep books, toys and other baby supplies at hand. The seat is spacious and well cushioned. The design is traditional with neutral colors that go nicely with any home or nursery. The beige glider is available with a bla ck, cherry or brown wood base, white the grey version has a white base. Assembly (attaching the back and arms) is quick and can be done in less than 30 minutes. This is a really cheap glider and ottoman set so it isn’t the highest quality on the market, but many parents said it lasted them a long time, and the only thing they needed to replace after a considerable amount of use was the cushions to find something more padded. Overall it is amazing value for money from Storkcraft, providing you with affordable gliders and ottomans. 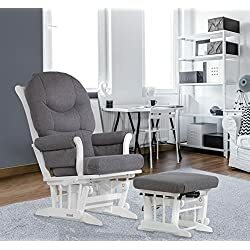 Babyletto have produced an exceptionaly high-quality swivel rocker nursery chair, perfect as a baby room rocker recliner or for use anywhere in your house where you want a bit of extra comfort. This chair reclines using a hidden button control on the inner side of the armrest, and reclines quietly, lowering the headrest and raising the footrest into and almost horizontal position. There is a USB charging port on the armrest as well, for that extra bit of technological luxury, to relax and recharge your batteries both figuratively and literally! The chair not only reclines, it also swivels 270 degrees. It is available in charcoal, grey and white, and is constructed and upholstered by hand and free of chemical retardants. A lumbar pillow is included for additional comfort. Babyletto’s Kiwi Electronic Recliner is modern, stylish and really high quality, and will comfort both you and your baby. Rocking chairs are often used in the nursery then sold or thrown away when the children get bigger. 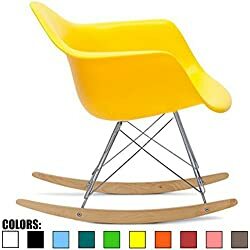 This modern twist on the rocking chair is made of colorful plastic in a variety of colors, and can be used in any room of a modern home. The affordable rocking chair is made of ash wood while the supports are chromed steel, creating a sturdy, robust rocking chair. You can buy cushions ad use them for nursing and spending time with baby, and then the whole family can benefit from this stylish chair, as it isn’t limited to nursery use. This rocking chair isn’t very big, so if you’re 6ft then you might not fit in it, but it’s perfect for smaller frames and many parents use it in the playroom and teenage bedrooms as well. It’s easy to assemble in just a few minutes. This retro-modern chair is great value for money and will last you a very long time, with a design so simple that it won’t go out of fashion. If you’re after an inexpensive rocking chair then this is your best bet! 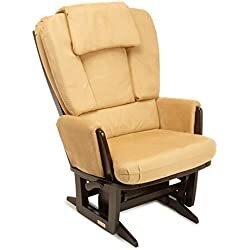 These recliner gliders and ottomans for nurserys are traditional style gliders with a spacious seating area and built-in nursing pillows, to facilitate nursing, especially during late night feeds. That’s why I think that this style makes a great breastfeeding glider. This Dutailier glider has a multi-position reclining mechanism which allows you to fully adjust the backrest to the position that you find most comfortable out of the 6 options. The solidwood frame is durable and the fabric is easy to clean and maintain. The weight capacity for this glider is high and the chair is roomy, which makes it extremely comfortable but not ideal for small spaces. The gliding motion is extra long and silent in order for a smooth rocking experience. The ottoman can be bought separately. The Grand rocking chair is especially good for tall people, with full head, back, arm and leg support for people of all heights. There is also the Sleigh version which is a very similar model and is another extremely comfy nursing chair.